Statement ski all-in-one will have you racing to fresh powder. In wind and waterproof fabric with insulating primaloft lining, it's highly technical for a day on the slopes with a protective hood. Designed in 4 way stretch fabric for ease of movement, wear or detach the belt and faux fur collar, and secure essentials in the water-resistant zip pockets. Composition: Main: 65% Polyester, 31% Polyamide, 4% Elastane. Contrast Leg Panel: 100% Polyamide Lining and Gaitor: 100% Polyester. Cuff trim: 80% Polyamide, 20% Elastane. Fur trim: 45% Modacrylic, 45% Acrylic, 10% Polyester. Insulation: 100% Polyester. 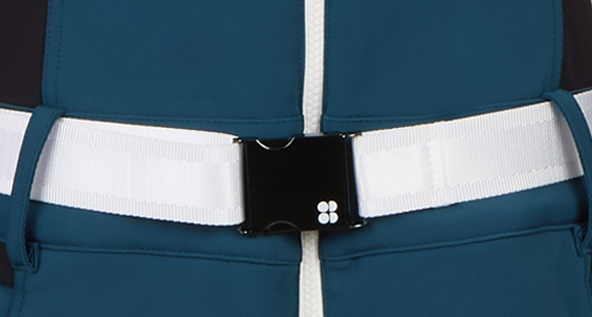 Backcountry Softshell Ski All in One is rated 4.8 out of 5 by 5. Rated 5 out of 5 by MrsAigen from Best technical and fun ski suit all year! I loved this from day 1 but didn’t purchase until later in the season. This is by far the most technical and fun ski suit I purchased all year. It’s made for the true skier, not just Apres ... I bought several other brands and none come close to this especially with what I paid. Wearing my Sweaty Betty’s on the mountain all season I was always warm while my ski instructor and others complained of being cold. This suit is so comfy, cute, tons of pockets in the right places, high tech fabric and all around fun. I love my Sweaty Betty’s , ended up buying some base layers for my instructor who called them “a game changer” and I can’t wait to see next years style. Please SB, stay technical so I can ski at 5 degrees F. ( and under). Next year I’m buying the new one at the beginning of the season! Rated 5 out of 5 by BoardGirl from Ski suit Bought this ski suit last year, in grey. I love it so much. I use it on the local hills where the average temps are -3 or so. Keeps me warm. The fit is perfect. I am 5'8'. It's a challenge to go to the bathroom without anything dragging on the floor (you have to scoop the top half in your hands) but worth it not to have snow down the bum. Rated 5 out of 5 by Snowslasher from Looking good while staying warm and dry! Definitely the perfect mix of fashion and functionality. Rated 5 out of 5 by MyDaughterIsPicky from Soooooo Cute!!!!! Bought this for my daughter. It's the cutest suit EVER!!! She is usually a small. I bought it in a medium and it gives her room for her wicking layer. The inside is really soft and it's really warm. It's really the first suit we both agreed on, it's so cute. Rated 4 out of 5 by AspenChick from Love Sweatys Onesies for Skiing I own and wear many on SB ski items. My most recent purchase is this Ski All In One. It almost the same to last years in a better color because white is hard to keep spotless. My entire body is warm with the exception of my arms this GI around. Also, the Ski Pass pocket was not finished at the bottom of the pocket and almost lost my car key and pass twice in one Morning. Other than this I love this Onesie and will continue enjoying it and rotating through my many pieces. Thanks SB!